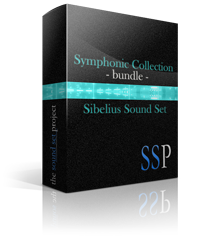 The Complete Symphonic Collection sample libraries must be purchased separately. This product facilitates use of the Complete Symphonic Collection libraries in Sibelius. IT IS NOT A SAMPLE LIBRARY and DOES NOT CONTAIN ANY SOUNDS. To purchase the Complete Symphonic Collection libraries, please visit the Sonivox website. Complete Symphonic Collection, Symphonic Brass Collection, Symphonic Harp Collection, Symphonic Percussion Collection, Symphonic Strings Collection, and Symphonic Woodwinds Collections © Sonic Network, Inc..